Remember the Game Boy? Even if you aren't old enough to have owned and played one when they were still a “new thing”, your mobile gaming habits owe no small debt to the small wonder from Nintendo. Not only was it one of the best-selling dedicated video game devices of all time, its software had an unprecedented compatibility streak of 17 years — Nintendo was still selling devices capable of playing Game Boy cartridges as late as 2006! So yeah, this is another traditional Asian tile-matching game brought into the modern age. Like the Famicom's Mahjong before it, Yakuman was a Japan-only launch title. Tile games like this are very well suited for the touch capabilities of the DS, and the also Japan-exclusive sequel gets the full Nintendo treatment, with Mario characters and lots of options. Wouldn't this be a great eShop game worldwide for 3DS or Wii U? It’s a Breakout / Arkanoid clone with Mario shoehorned in because... Nintendo. It’s a very basic game. If you play through all 20+ levels, you start over. And I played this little gem to DEATH on my original Game Boy. Naturally, I was a bit let down when I played it again all these years later on 3DS Virtual Console, and that emulation is probably all that’s warranted for any sort of re-release or sequel. Basically the board game “Battleship” without the license, this military strategy includes two modes of play and submarine action, which leaves open the possibility 3DS launch title Steel Diver is some sort of sequel. Like Steel Diver, Radar Mission is neither a great nor a terrible game and may be worth the Virtual Console price if you really enjoy turn-based strategy games. 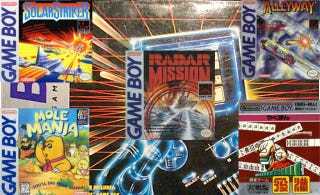 Of all the Game Boy games I owned as a kid, this probably got the most mileage after Tetris. Not because it was a great game, or because it was necessarily addictive, but because I so very badly wanted to finish it, beat it, complete it and get on with my life. Nintendo has never shown much fondness for shoot-em-ups or space warfare (outside of Star Fox), and while this doesn't really qualify as “bullet hell” it was challenging enough to keep the younger me from advancing more than about halfway. Virtual Console release, please! Confession time: I had no idea this game existed prior to its release on Virtual Console last year. I was even more surprised to learn this puzzle game was produced and designed by none other than Shigeru Miyamoto. (That guy does EVERYTHING.) His weirdly story-driven game Moguranya made its way to the West a year after its Japan release with a new name, Mole Mania... and that’s about it. Visually and thematically, it reminds me of the free game Word Mole that comes installed on most BlackBerry phones. Next week, I’ll continue my look at forgotten franchises from Nintendo’s mobile past! And please keep the excellent comments coming — I want to hear about your favorite lost IP from the Game Boy / Game Gear / Lynx era!